Time for one last post to conclude Mr. Movies October marathon. 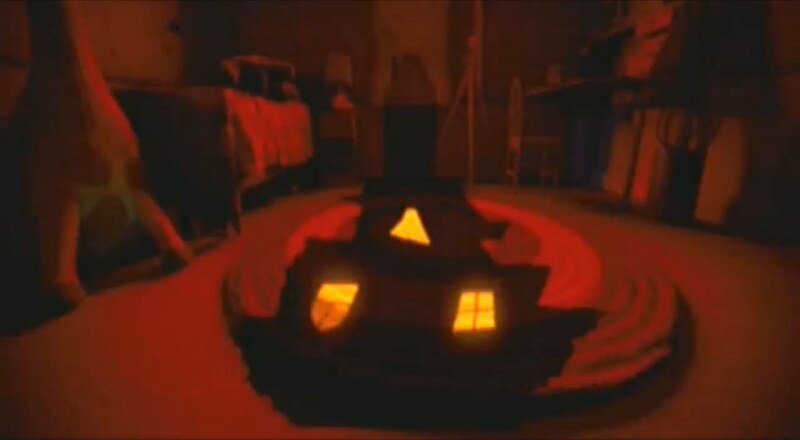 When I was a kid around Halloween, my friends and I would turn off the lights in the house, have some scary music and sound effects playing which made it feel spooky and haunted. Some friends would dress up in monster costumes while others would go exploring with flash lights, it was like we were in a Halloween adventure of our own universe. By the end of my 3rd grade year we moved away and I regrettably was never able to have a Halloween with them again. So I gradually began to lose that excitement of exploring a fictional haunted house with friends. 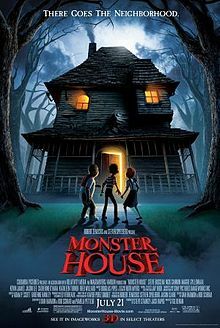 But then toured the end of my High School years, I saw a movie that immediately took me back to that time when friends would go adventuring on Halloween, this is the 2006 animated masterpiece called “Monster House”. 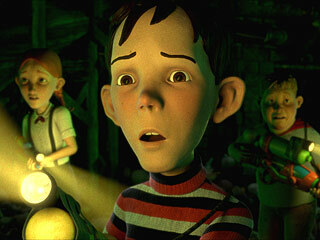 This is by far one of the greatest Horror movies for kids. If you thought monsters under the bead were scary, wait till you see an entire house come to life. The plot focuses on three children named DJ, Chowder and Jenny, which is basically the classic formula of a small group of friends that's made up of two boys and one girl, its classic. The lead character DJ is having suspicions about this angry old man who lives in a creepy looking house that’s just across from his home. After an unfortunate accident, DJ feels responsible for the apparent death of the old man, who seemed to pass away in his front yard while DJ and his friend were playing outside. Then he begins to notice some strange things happening over at that creepy house. People are diapering and his two friends were almost eaten by the house itself. None of the adults believe them, so they have to take matters into their own hands, find a way to defeat the house and save the neighborhood. 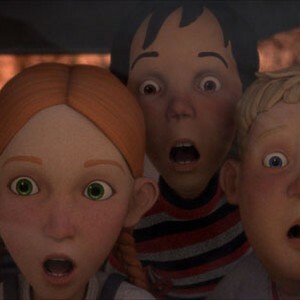 The rest of the movie is just these kids going on exciting, funny and sometimes scary adventures, exploring an old dark house and facing dangerous obstacles, it’s awesome! On paper, this may sound like a very cliché haunted house film for kids but the writing is quiet competent and the back story of how the house became haunted is surprisingly tragic. Film legend Steven Spielberg helped produce this movie along with Robert Zemeckis, who’s done some of the greatest family movies of all time like “Back to the Future”, “Who Framed Roger Rabbit” and “The Polar Express”. 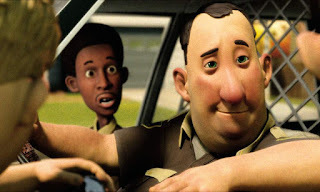 The animation in this film ranges from bad to amazing and it’s really hard to decide if it’s one of the worst or best looking animated films I’ve ever seen. The animation portions that I can’t stand are with all the human characters as they look and move like puppets on strings. 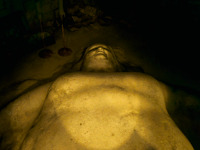 It almost makes you feel like it’s stop motion animation as opposed to CG animation. 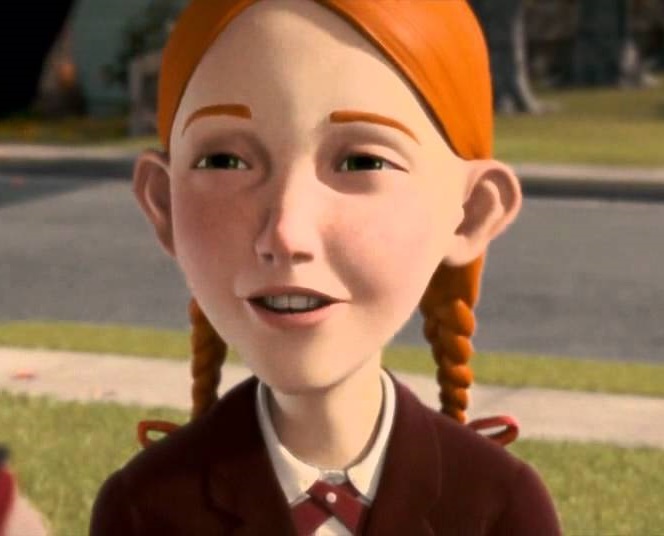 Except even stop motion characters from movies like “Coraline” look better than this. Now the animation I love in this film come from all the all the fall visuals, skinny trees and creative spooky imagery. I love animation of this one nightmare sequence, and the interiors of the house are stunning. There’s one moment with our characters running past various obstacles in the house and it almost resembles a theme park ride. 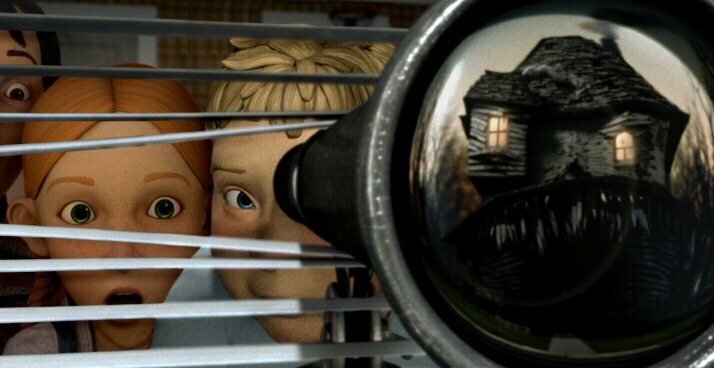 All the different visuals that were used to bring this house to life are absolutely brilliant and some of the most thrilling animated sequences ever put into film. Everything builds to a climactic final battle with the house as it rises up out of its place and attacks the kids. When this finally happens, hot Damn is it spectacular! Watching these kids go exploring through this visually amazing house, discovering clues and hidden secrets is so much fun and rekindles the inner child in me looking for adventure on Halloween. It really dose take me back to that time when I was young and would go on imaginary spooky haunted house adventures with my friends. It’s like getting all the tricks and treats you’d want around Halloween and it welcomes both kids and adults alike into an imaginative household full of smart, exciting, nostalgic and monstrous fun. 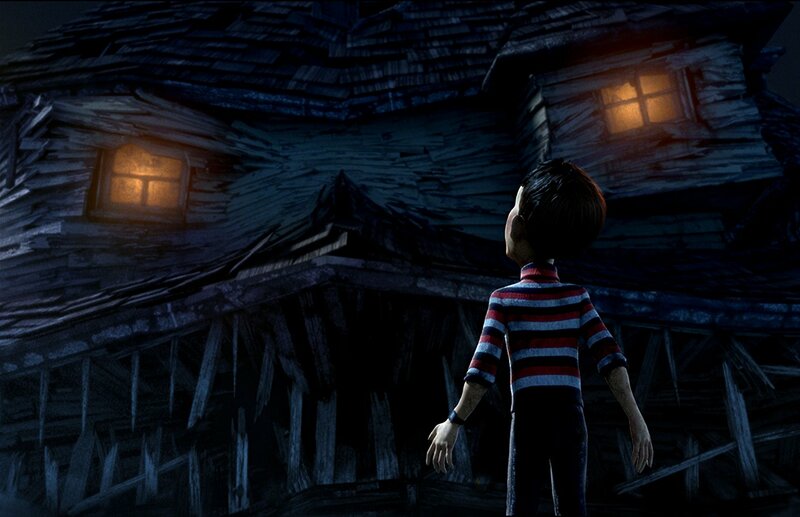 I give “Monster House” 4 stars out of 4, it’s awesome! With voice, SMS and data plans costing you £0.00/month (100% FREE).